Neighborhoods across the Southland are figuring out ways to be more bicycle and pedestrian-friendly, but they still have to factor in cars and where and how to park them,. 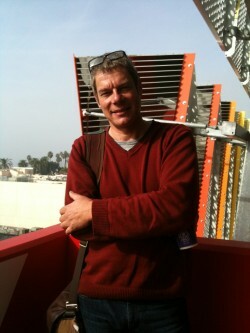 The City of Santa Monica has just built a striking parking structure, designed by Christof Jantzen, that is winning plaudits from pedestrians. Neighborhoods across the Southland are figuring out ways to be more bicycle and pedestrian-friendly, but they still have to factor in cars and where and how to park them, especially if their shopping and business districts are to remain competitive. 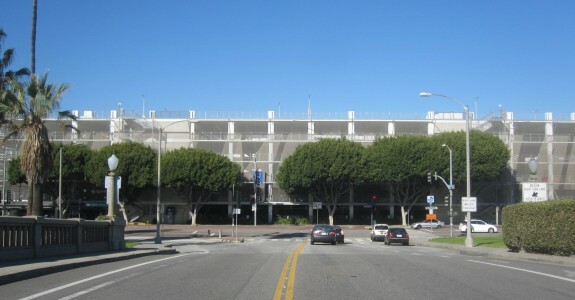 The City of Santa Monica has just built a replacement parking structure — Number Six — on 2nd Street between Broadway and Santa Monica Boulevard, adjacent to 3rd Street Promenade. And in a city with a history of trying to beautify its parking (Frank Gehry’s structure for the 1980 Santa Monica Place peeks out from behind growing Ficus trees, below), this one takes it a step further — literally, as DnA found out when it visited with the architect and had a chance encounter with a jogger. With Christof Jantzen and Alex Lightman. Parking Structure #6 was designed by architect Christof Jantzen, of Studio Jantzen, in collaboration with Morley Construction Company and International Parking Design. While regular in layout, it features more spaces than usual for charging electric cars (30 spaces, with infrastructure for 130) and for bicycles (70 spaces in the structure, 40 on the sidewalk outside) as well as retail space on the ground floor, and solar panels on the roof. And then it has a very eye-catching façade. First off, it pops with red, orange and yellow metal panels, each set at a different angle, says Jantzen, to reflect light in a way that illuminates the interior. The panels’ colors are intended not merely to look sunny but to correspond, metaphorically, with changing illumination levels on the façade. 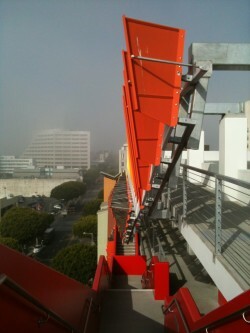 Add to that a bold red stair, descending from top to bottom of the building on the street-side, akin to the external escalator at BCAM, the Centre Pompidou or the Beverly Center. 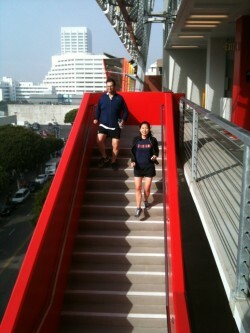 The point of the stair, explains Jantzen, while standing at the top of it (right), is to “vertically continue the sidewalk,” integrating the structure with the pedestrian experience, giving it a civic presence and making it part of a multi-modal approach to mobility in downtown Santa Monica. On listening to him, while enjoying the view and the carefully wrought, colorful skin of panels, it was hard to avoid the thought: this looks great and sounds great in theory. . . but was it overly expensive and over-designed relative to its use: warehousing cars? While we were discussing this, Christof and I noticed that two people in shorts and sneakers had run down the stairs, and then back up again, and then down again. Out of curiosity, I buttonholed one of the runners. He turned out to be Alex Lightman (right) a futurist and writer about technology whose books include Brave New Unwired World. He’s also a nearby resident who has given up his car and, it turned out, had been waiting a year for this structure to open so he could run up and down its external stairway. This, he declared, is “Santa Monica Steps 2.0,” launching into an effusive articulation of the urban, health-giving and civic goals of this structure. 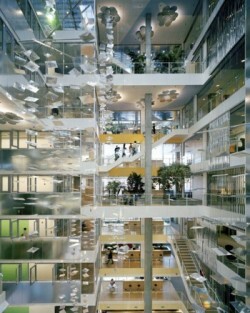 Alex Lightman then became the interlocutor: was the architect, he asked Christof, trying to create a “subtley subversive” parking structure? This was a moment an architect might dream of: when a member of the public uses the building exactly how the designer had intended, and adds even more. . .
Of course though, one wonders if the more “subversive” act might have been to encourage walking by not build a parking structure at all. But as Lightman argues in the segment, you can’t force people out of their cars. And even though a rising number of Angelenos is making the choice he did, to give up their car altogether, still a majority drive and if they can’t park near shops they will go to another neighborhood where they can. 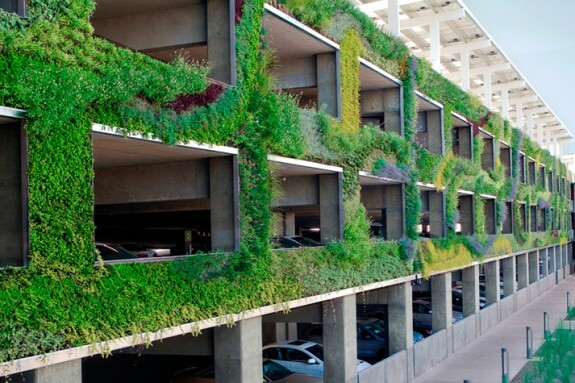 Build a Better Burb, an online publication “dedicated to improving suburban design,” drew our attention to the “green-walled” parking structure on Edwards Lifesciences’ Irvine, CA corporate campus. 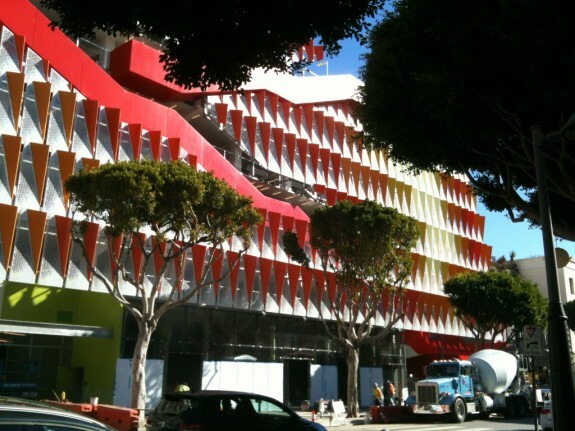 Send us parking structures you admire, and we’ll keep on top of this evolving building type.